Click here for full 2018/19 programme and Membership Application Form. Our village is steeped in history, and our society exists to make it known more widely. We hope that you will learn about the main families, estates and buildings by following the links on the left. We are now also building up a large picture collection - see the Picture Gallery for details. The Ordnance Survey map on the left shows the village more or less as it was in the 1930's. Click on it to see the wider local area, free of motorways and houses. If you've visited our site before, click click here to see what's been changed or added. If you're looking for a name or place, you can enter a keyword below. This used to be the CD version of the web site, containing extra data on the 'Census data' and related pages. Since the end of March 2018, the CD is no longer sold, and all of the data can be found here for free. 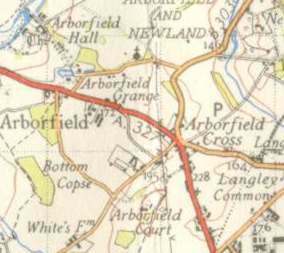 'Arborfield' is in fact two settlements; much of what we know as 'Arborfield Cross' was actually in the Liberty of Newland. The focal point is the Cross, which has been a crossroads for many centuries. It gained a new meaning in 1919 when the War Memorial was erected. Click here for a stunning view of the Cross in winter, care of Reading Local Studies Library's on-line collection, and see what the cross-roads was like in 1927. During 2004, the Memorial was removed and repaired while the five-way junction was being re-shaped. Click here to see it as it was on Remembrance Sunday 2004. Celtic remains have been found at Arborfield Court, and Roman pottery was found when work started on the "Badgers' Mount" housing development; Roman coins have also been found near the village centre, which is a couple of miles north of the "Devil's Highway" that linked London with Silchester. The medieval settlement of Arborfield by the River Loddon included a manor house and wooden church dating from Saxon times; both were later re-built, the church in the 13th Century in flint and chalk, the house much later in 1603 and again in 1842. A mill using power and water from the river produced high quality paper. 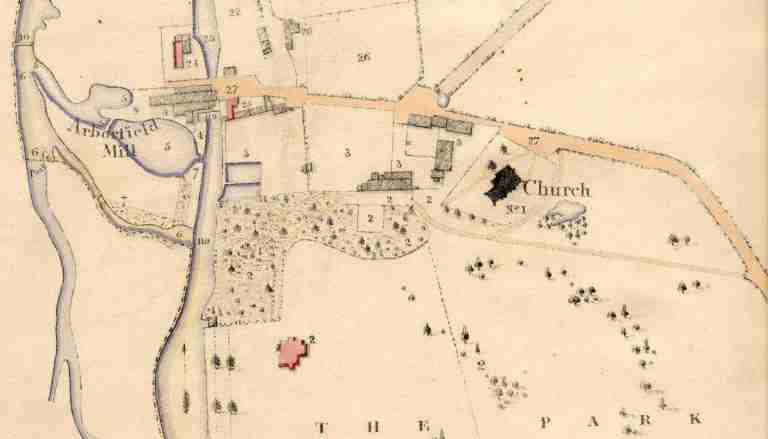 These buildings are shown as they were in 1839 on the Tithe Apportionment map. By the 15th Century, a group of buildings had already been established at or near the crossroads, with the two Inns creating a centre for trade for the local farming community and travellers. Some of these old buildings are now in the Conservation Area. The Thomas Pride Map of 1790, which you can see in the Reading Local Studies Library, shows Arborfield Cross and the old village of Arborfield by the River Loddon. It also shows that there used to be many more dwellings in 'Newland' close to the Mole Brook, between Hughes Green and Bearwood. The big growth came in the 20th Century when the Remount Depot was established to the south in Barkham. 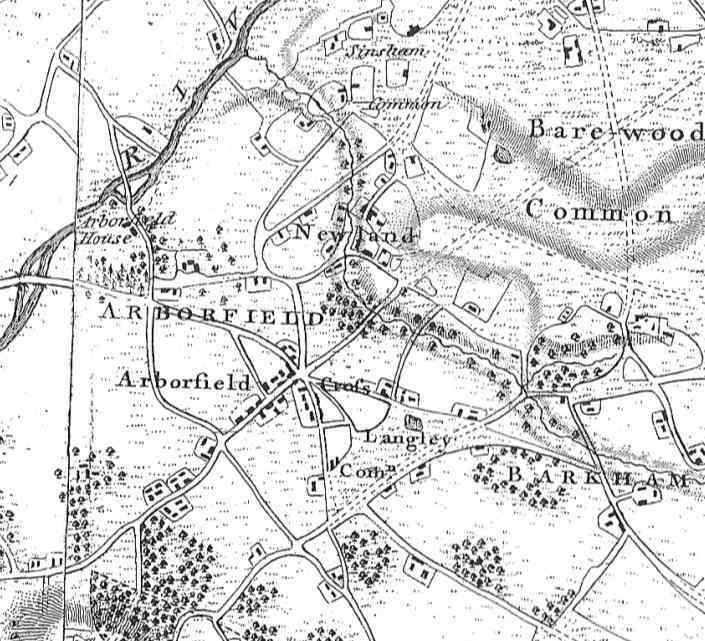 When it expanded into a garrison, the main entrance happened to be in Arborfield, and the name 'Arborfield Garrison' stuck. Many residents have an Army background, moving into the village when they retired from military life. The British Legion has its County HQ here. The diversion of the M4 from its original planned route through south Oxfordshire had a profound effect on the village. The new route passed south of Reading with junctions at Winnersh and Three Mile Cross, and large numbers of commuters now use Arborfield to get to and from the Motorway. They've had plenty of time to see the village as they waited to go through the crossroads. The five-way junction was reshaped as a large roundabout to cope with the growth. Over a century earlier, there was huge support for the proposed Basingstoke - Wokingham Railway, which the local paper described as "a projected line, a little over 14 miles in length, which will probably do more than any other of a similar length in the South of England." If it had been built, it would have passed right through what is now Arborfield Garrison, under a bridge at Biggs Lane, and then over another bridge at Barkham Street. However, in the event, the scheme never made it through Parliament. There's been a major change in the pattern of work. A century ago, over half of the residents were 'in service' while most of the rest were in agriculture. Many of the residents now work in the high-tech industries of the Thames Valley. Berkshire Record Office is currently digitising its Enclosure Award map collection, and you are now able to see the map covering the Liberty of Newland. 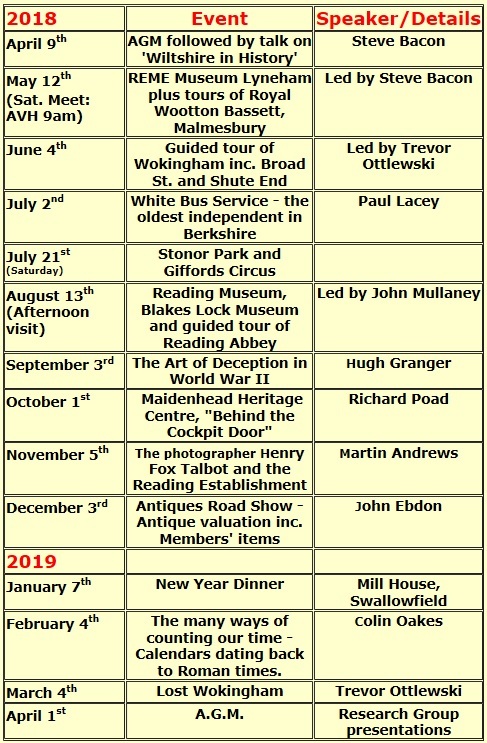 Visit www.berkshirenclosure.org.uk for the main site, or jump straight to the Newland map by clicking here. It'll be worth the wait. You'll be able to zoom in on the whole map when it's all been downloaded. We are keen to hear from anyone who has reminiscences of life in Arborfield, or who has old photographs that can be shared with others. We would love to see photos of buildings that have since been demolished or changed, or of local characters. One project is to fill in gaps in data from the Parish Registers, which were stolen in the mid-1970's. The Marriage Register covered the period from 1837. Although we have been able to prepare a marriage index covering the entire period since 1837, we don't have the depth of information that a marriage certificate would show. If you have inherited an ancestor's Marriage Certificate covering this period, please let us know so that we can record the details. 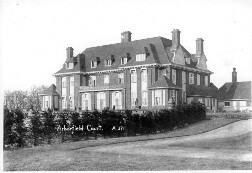 Arborfield Court celebrated its Centenary in 2006. We are anxious to fill in the many gaps in our knowledge of the mansion in its early days, and when it was eventually split into apartments. Did you train in the grounds during WWII? A aerial photograph from 1946 has revealed many scars from military exercises that happened there, and we'd love to know more.